Glamorgan claimed a home tie in the quarter-finals of the T20 Blast as rain saved them from almost certain defeat against Sussex. Sussex made the most of bowling first on a used pitch as they skittled Glamorgan for 101 in a 14-overs game. The home side had reached 30-1 when the rain arrived after one ball of the fifth over - five deliveries before a result could have been calculated. No more play was possible and the match was abandoned. Winning the toss was crucial for home captain Luke Wright and after an eccentric first 10-ball over from Tymal Mills, Glamorgan turned in a woeful batting performance with 26 extras the main contributor. George Garton, who had not previously taken a T20 wicket, claimed four victims and Mills two, while Matt Machan took five catches including a superb boundary effort to dismiss Aneurin Donald. Last pair Michael Hogan and Shaun Tait scrambled the total into three figures before Chris Jordan finished the innings off. 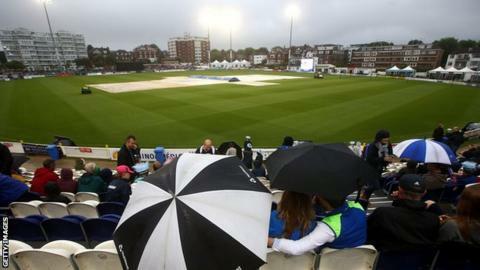 The weather closed in after four overs of the Sussex reply, and although the umpires managed to get the players out for one further ball, a heavier downpour brought an end to the game, to Sussex's frustration. Essex's win over Middlesex at Lord's moments earlier means Middlesex cannot overtake second-placed Glamorgan. Sussex saw their last slim hope of qualification washed away with the rain. "It wasn't forecast, and the rain sneaked up on us with five balls left until it constituted a game - so disappointed not to get a game in. "We did well, apart from the extras we conceded, and to bowl them out for that score was a great effort. "George Garton has been really exciting and we said we wanted to play young talent, we've showed some of the young talent we've got. "There's quite a few games we've just missed out where we should have got over the line comfortably... you look back on those games with huge regret, but the table doesn't lie and we've got to improve." "It definitely wasn't one of our better batting performances, and sometimes in a shortened game you don't know how to go about your business. "The win from Essex at Lord's worked in our favour and all the boys were glued to the TV watching that. "We play Essex now, they've got it all to play for so it's important for us to park this game, rock up and start afresh."